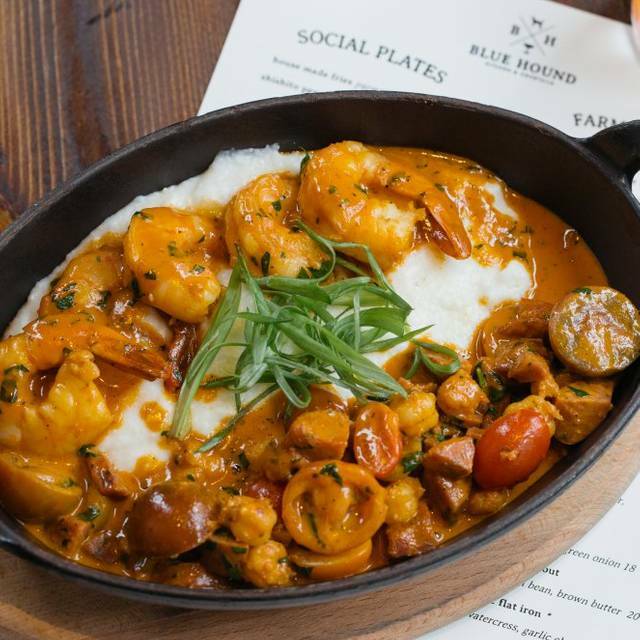 We offer a complimentary 2 hour validation for self parking and $5 valet, with validation, while dining in Blue Hound Kitchen & Cocktails. Conveniently located near light rail stops. Washington & Central, when traveling west bound, as well as Jefferson & 1st Avenue when traveling east bound. If you are taking a Lyft or Uber, the Hotel Palomar's main entrance is located just east of Central, on Jefferson. 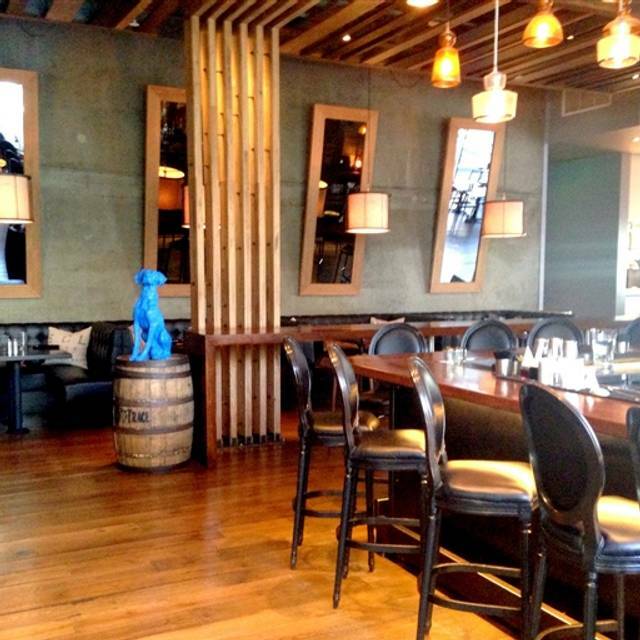 Blue Hound Kitchen & Cocktails is located on the 2nd floor. 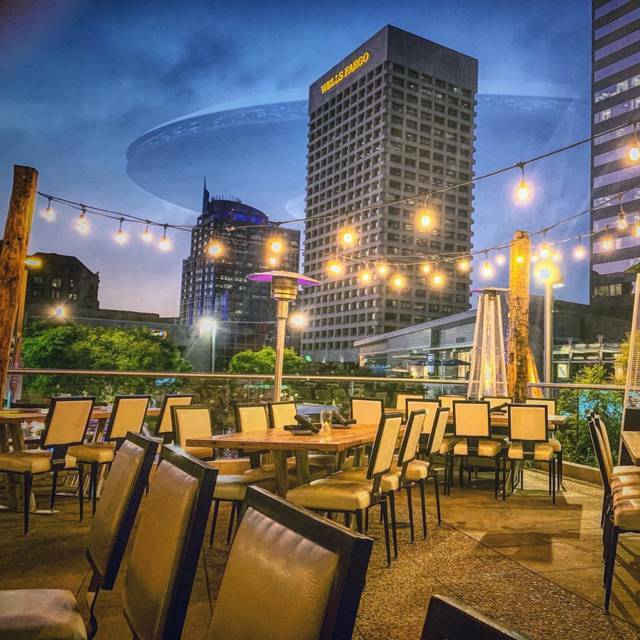 Weekend live entertainment that includes DJs and Bands on our 3rd floor rooftop bar, Lustre. It's not just the space... all touch points of the experience are special. Whatever the request, we're quick, nimble, and attentive so each custom event is worth repeating. Your guests will enjoy a true culinary experience every time. We have an onsite restaurant sales coordinator for all your large party needs. We welcome partial and full restaurant buy-outs 7 days a week. From unexpected, locally inspired cocktails to thoughtfully presented food, we're happy to perk up your event as usual. 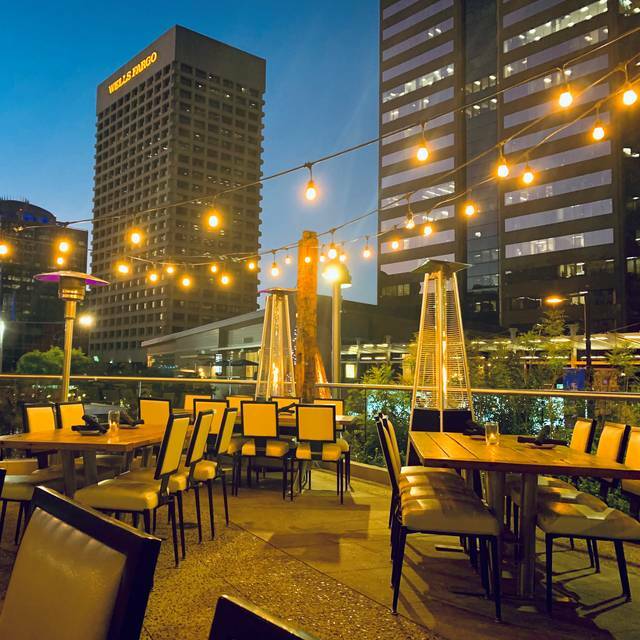 The Hotel Palomar Phoenix features over 10,000 square feet of meeting space spread across boardrooms, ballrooms, suites, and a magnificent rooftop pool deck and patio, with glorious views of Phoenix's South Mountain and the ever-growing Downtown Skyline. The Palomar Phoenix can easily accommodate a myriad of custom-sized group meetings, business functions, social events, weddings, celebrations, etc. 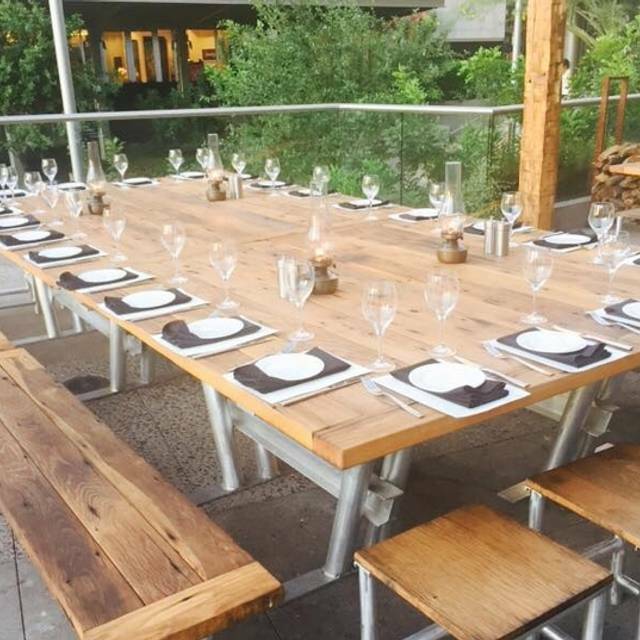 Give us a call and we can place you in the perfect spot for your own personal event. 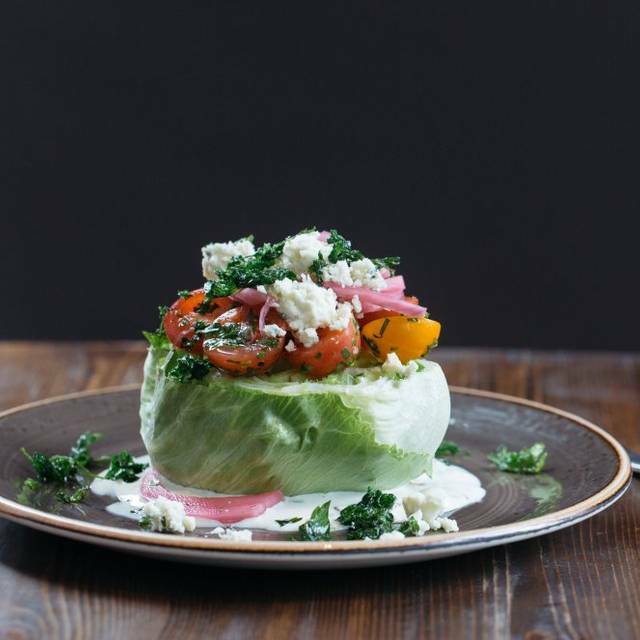 Blue Hound is a New American kitchen serving breakfast, lunch and dinner centered in the heart of Downtown Phoenix's vibrant Cityscape development & chiseled into the 2nd floor of the stylish Kimpton Hotel Palomar Phoenix. 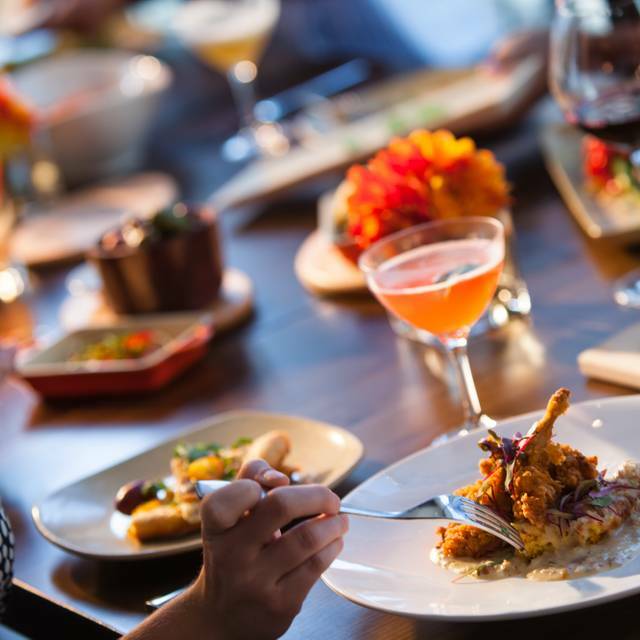 Executive Chef Dushyant Singh has created an elevated, yet approachable dining experience. Utilizing undiscovered flavors, seasonal ingredients and contemporary techniques, the menu offers familiar yet refined favorites that share the spotlight with sophisticated shareable plates and an expanded curated-beef program featuring high-quality butcher’s cuts like ribeye, pork chop and steak. 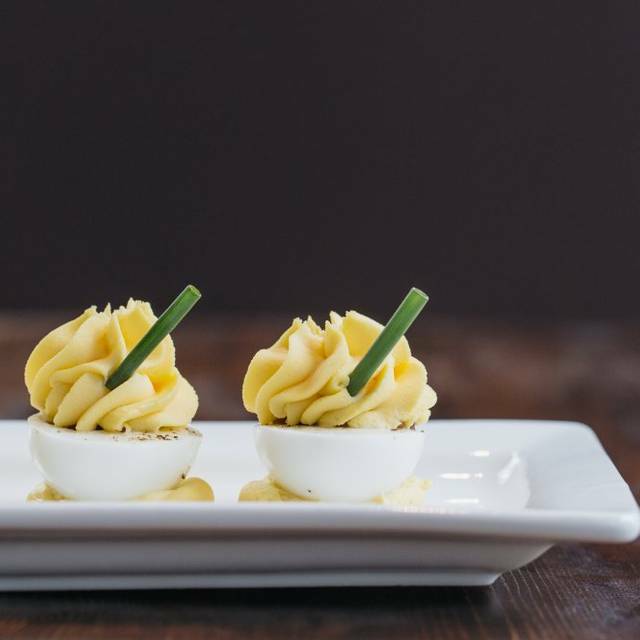 Blue Hound’s cuisine artfully pairs with its award-winning cocktail program that raises the bar for drink culture in the city. Complete with seasonal craft cocktails and Valley's largest menu of brown spirits, top-notch gins and house-made tinctures and syrups, Blue Hound is a celebrated neighborhood staple for locals and travelers alike. Great food, friendly service. 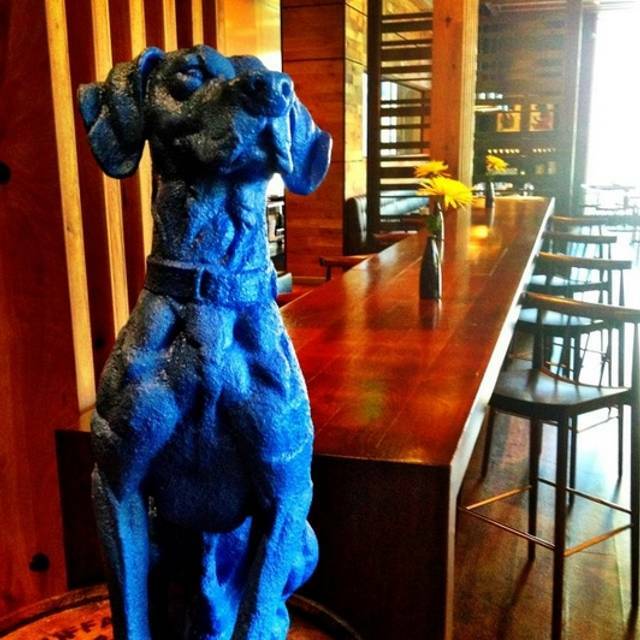 Out of town friends love everything about Blue Hound. Will definitely be back! Opening the giant wooden door, I felt like I was stepping back in time into a craft based bar, after being walked through the hip crowd and seated next to the windows, we browsed over the drink menu and settle on the Pink One and a dark and stormy. With no hesitation our server returned with our amazing looking drinks and took our food order. My pasta was basic but perfect at the same time, home made pasta with tomatoes and pesto to make the purest Italian jealous and my husband ordered the Lamb Shanks that whisked him to the country side of England. After finishing each inch of our plates, our waiter returned with a dessert menu.... looked amazing but unfortunately we were too satisfied to participate in the gluttony. We will be back to explore the rest of the menu. Awesome service. Great food. Excellent value. What more can you ask for? I was pleasantly surprised by the quality of the homemade pasta; well worth a try. The brussel sprouts are not to be missed. Enjoy if you happen to be in the neighborhood. Visiting from out of town we stumbled on this Restraunt through open table. Upon arrival the hostesses were very pleasant and greeted us with smiles. The ambiance was casual and the food selections were excellent. Our server Jenna was delightful and attentive, as were the other staff members working the floor. Will definitely come back next time in Phoenix. Fun date night! Excellent cocktails, food and great service! We'll back! Nice outdoor patio for a Sunday brunch. Menus was not specially prepared for brunch but was descent . My wife and I had dinner before the Michael Buble concert. I had a shrimp dish, and my wife had a chicken dish, both excellently prepared. Very nice place for a special occasion. Too expensive for regular dining though. Great experience. Definitely one to check out. The shrimp and grits were outstanding. Great views of downtown Phoenix. The bartender was fantastic! Food was really good, big portions. We were happy that we shared. Creative menu and interesting flavor compositions. If you like steak the brown butter bearnaise is great. Standout among deserts was tiramisu which is created like a trifle. Service friendly and informed. Only minuses were slow kitchen ( almost an hour for mains) and lukewarm food. Simply looking for a place to eat that we different from chain type foods. Found food the be very good, signature old fashioned was amazing and service excellent. Nice eclectic mix of food. Expensive for a hotel restaurant and bar. Food tasty, smaller portions. Conference in Phoenix and took 8 business associates out for dinner, amazing food, a little crowded, but a great time. We spent 3-4 nights going out for dinners and lunch, Blue Hound was consensus as the best food. exceeded expectations. the salmon was outstanding. The rib eye very good, but not the level of Steak 44 or Mastros. Every appetizer, salad, and main entree we had was more delicious than the last. We all thoroughly enjoyed the food and ambiance. The noise level made it a bit difficult to hear conversation across the table, but otherwise we had a wonderful experience! Service was excellent but food was simply not up to par. Bread appetizer was 3 slices of bread which seemed more like an item most restaurants simply provided at the table but cost $6 here. Ordered the "Street Frites" (french fries) which were ironically unsalted with two sauces, ranch dressing and some flavorless orange/yellow concoction. Salt and ketchup would have been far better. Caesar salad for two was good. We each had the bone-in ribeye steak which was done to order but presentation was lacking and it was so horribly over salted that neither one of us could eat much of it. Same for our sides which included macaroni and cheese as well as sweet corn. Both horribly over salted and the corn was not flavorful at all. The service was excellent and we had high hopes but the food overall was very disappointing. Food is the best I've ever had. Servers were great. A bit pricy but totally worth it. They have a clever cocktail list which made for a great start. An octopus special was a delicious starter to share. We had steaks, salmon and chops and everyone enjoyed their entrees. The service was friendly and efficient. The place was hopping, but everything flowed smoothly so we had plenty of time to catch our show after. It’s a attractive urban space, a bit noisy, but that’s because it’s so lively. Wonderful food and service in a very energetic atmosphere. We have dined here before and always enjoy it. Only glitch this time is that our original reservation at 6 pm morphed into 6:15 at Open Table. Restaurant indicated it was a problem with Open Table. Since we had theater tickets it could have been an issue, but the restaurant fixed it. Superb dinner. Excellent food. Great service. Can’t fault it. Best place we’ve been to for dinner in quite some time. We had a great time - the service at the bar was great! Ribeye was was phenomenal. Gena was our server and she’s the best! We just did starters and sharable sides they were amazing. The service was very attentive and the space is beautiful. I felt the noise level was ideal for feeling lively but not overwhelming. The steak I had was cooked perfectly and delicious. The only complaint is just that it is a little pricey. $8 for a Coors Lite is more than I’m willing to spend. a chopped salad topped with wild salmon. Delicious! We waited for our main courses for over an hour while 6 tables that were seated after us ate and left the restaurant . We made early reservations to give us plenty of time to have dinner and go to concert. The waiter never removed our drink and food menus from the table. When after we finished appetizers and drinks we asked when the main course would be out. It was already 45 minutes after we finished our appetizer. The waiter said it was being plated, but 15 minutes after that our food was not out and we needed to get to the concert. The manager comped our meal and said he was sorry that the kitchen was busy. That wasn’t entirely true as there were 6 tables seated after us that got their food and left while we were still waiting. Too bad we never got to try the food, but we won’t be back. Food was good, not great. Waiter was very good but bar was apparently backed up. They knew there were several events downtown and restaurant was book so why not have extra bartender? I might recommend this place based on food only. Service was horrendous. We ordered 2 rounds of $15 dollar martinis and asked for more olives. We were told we would have to pay for them. Said fine on the hill they were $4 USD!!!! If I am paying a premium for good food and drinks I think you can throw in a few extra olives. Great food and service. Nice wine list. Will be back again, salmon was marvelous. Not really impressed. Hostesses made us feel like we were bothering them and were an inconvenience. The food was just ok and super expensive. Ordered their tuna tartare app and it was literally just two pieces of tuna. The drinks were outrageously priced! The bartender was great though! Also- I am from San Diego and I am used to expensive places- this was over rated and over priced. Our waiter was excellent! Didn't rush us....and gave us our space. Dinner was fantastic! I ordered the Salmon and it was delicious. My husband commented that the Shrimp and Grits were the best he ever had! The server was superb and the food was fresh and excellent. Food was well prepared and service fantastic! Both the pork and steak were cooked as ordered. We were hoping to find a new place to go in downtown. Wasn’t that great. Not much food for a lot of money. I’d try elsewhere.